Microsoft seems to think that the U.S. nation consists solely of the areas where there are Microsoft Stores. Microsoft's attempt to mimic the Apple store resulted in the Microsoft Store, where it's a sure bet you'll be able to find a copy of Windows, some Xbox 360s, and maybe a Zune or two. Microsoft recently announced through Twitter that Kinect is playable nationwide in these storefronts, though the use of the term "nationwide" is a stretch. A really big stretch. The Microsoft Store Twitter account recently tweeted: "Can't wait to play #Kinect? Try it at #MicrosoftStores nationwide! No store in your area? You can pre-order online!" The issue is that there are only four Microsoft Stores in existence, and they're not quite big enough to span the nation. Microsoft got a little overzealous with its tweet, but if you live in Scottsdale, AZ; Mission Viejo, CA; San Diego, CA; or Lone Tree, CO; you can get your hands, feet, and face into some Kinect action at a Microsoft Store today. 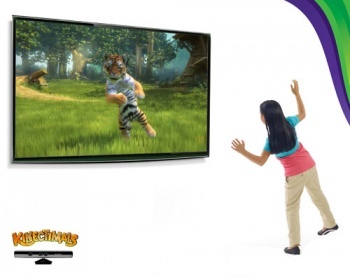 Later tweets make it appear that Kinect will only be on demo for the weekend and will feature games such as Kinectimals, where you raise five exotic animal cubs. I always thought I was a member of the nation, but my car is out of gas and Google Maps says it's going to take me 7 days of constant biking or 23 days of walking to get to the closest Microsoft Store, so I won't make it in time. However, other members of the nation that might live closer should get out there to try Kinect and see what they think. They'll be able to determine if Kinect is worth the first rumored then confirmed but not really confirmed $150 price tag.